I realize there are probably hundreds of different ways to make ribs, and I’m not here to stir up controversy or trump anyone else’s method. This is just how I make them. It’s not the “only” way to make them, I don’t tout it as the “best” way to make them, and those of you who like wet, saucy ribs will probably stop reading right….about….now. However, my ribs turn out tender, moist, and very flavorful every time I make them this way, so I thought I’d share it. Here’s a quick note on the heritage breeds of pork I use. Ever since hearing about heritage breeds, and after finally trying a couple of them, like Berkshire and Duroc, I have become an absolute pork snob. I won’t touch those flavorless national commodity brands, mass produced under less than ideal living conditions. Heritage breeds of pigs produce pork the way pork was meant to taste: with actual pork flavor, and good marbling of fat. Here’s a good article if you want to read more: Heritage Pork. Preheat an outdoor grill (an indoor oven method is described below) to 400-450 degrees or so. Pat ribs dry if they are wet. 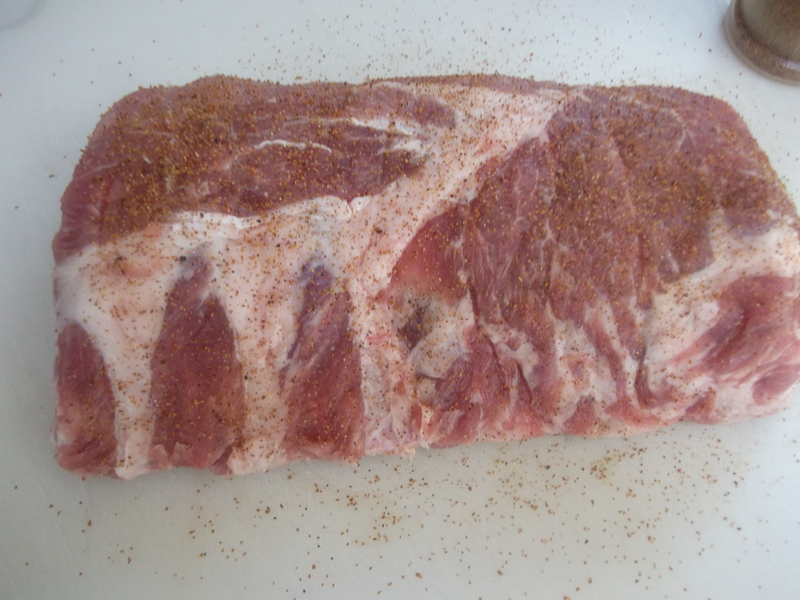 On the meaty side of the ribs, rub in the sugar, salt, pepper, and pork or rib seasoning. Coat the meat evenly, then spray that same side lightly with cooking spray or oil. Use just enough so the meat won’t stick to the grill. Place the meaty side down on the hot grill and sear the meat until grill marks are visible and the meat is nicely browned, about 2-3 minutes. 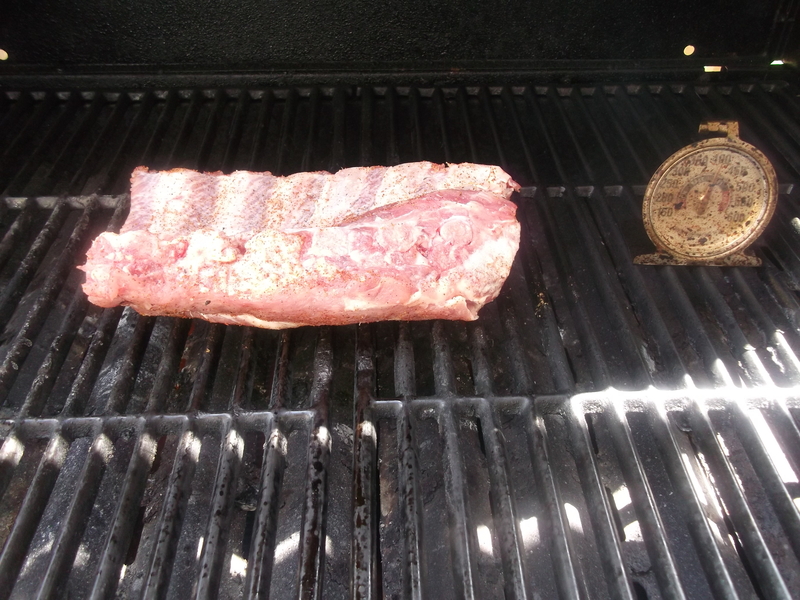 Remove the seared ribs and reduce the grill temperature to 225 to 250 degrees. 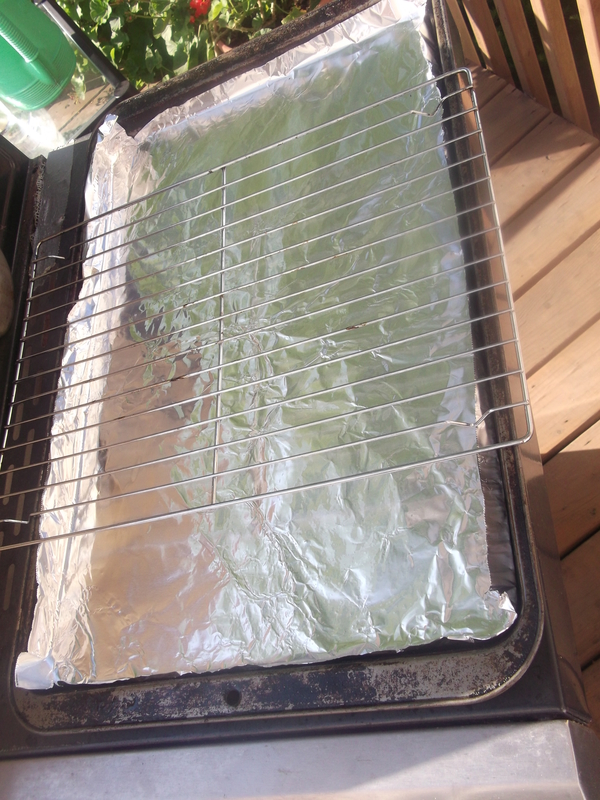 Line a sheet pan with foil, and place a baking rack over it. Place the ribs on the rack, place the pan on the grill, and fill the pan halfway with water (not so much that the rack or the ribs will touch the water). 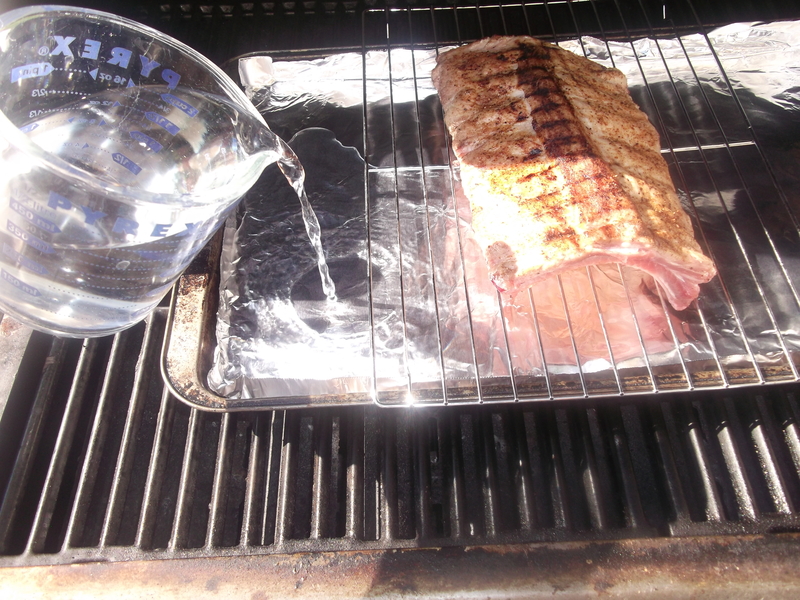 Cook for 4 hours at 225 to 250 degrees, turning the ribs over every hour and topping off the water as it evaporates. 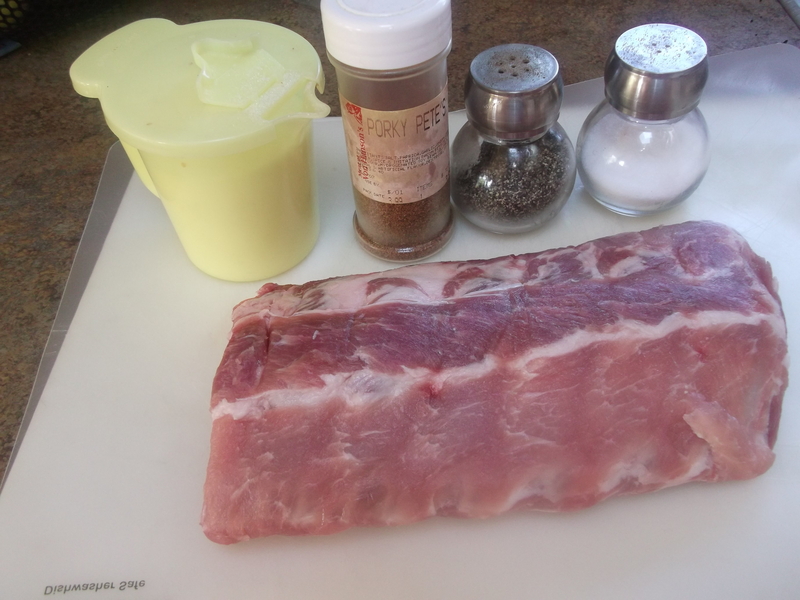 After 4 hours, remove the ribs and let sit at room temperature for about 10 minutes before serving. Indoor method: Making these indoors is pretty much the same. The only differences are that you will preheat the oven (instead of the grill) to 225 degrees, and you’ll sear the ribs in a preheated frying pan (it’s hot enough when water droplets dance and roll around all over when dropped on the hot pan). Preheat the grill to 400 or 450. I usually just put the two inside/middle grates on high so they get really hot. 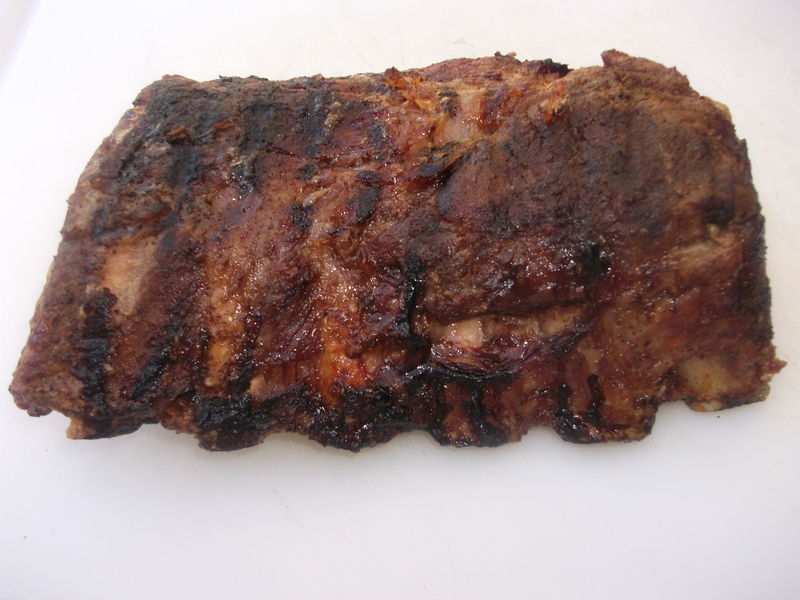 Make sure your ribs are dry: pat them down with a paper towel if they are wet. I have never measured how much of these dry ingredients I use, so I’m guessing ¼ t each of sugar, salt, and pepper, and maybe twice that of the rib seasoning. I love Porky Pete’s from Von Hansen’s Meats and have been using it for years. Rub the meaty side of the ribs with just a little sugar (this will help give the ribs a nice char when you sear them, but won’t affect the flavor), salt, pepper, and rib seasoning. Rub it all in to coat the meat evenly. If you want, you can season the other side of the ribs as well, but you can skip the sugar, as this side won’t be seared. Spray the meaty side lightly with cooking spray or oil, just enough so it doesn’t stick to the grill, and place the ribs, meaty side down, on the hot grates (leaving the grill cover open), until the ribs have visible grill marks and nice color, about 2-3 minutes. Lower the grill temperature to 250. 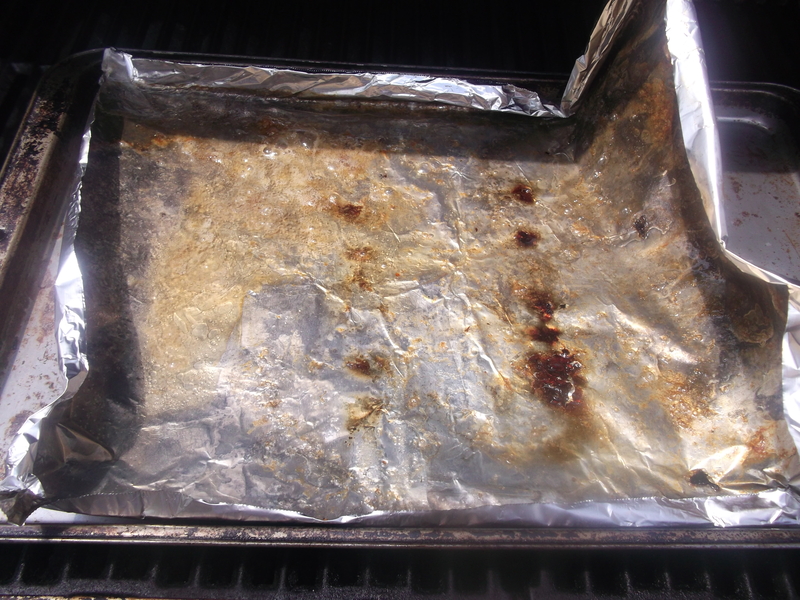 To do this on my grill, I turn the middle/inside burners off and turn on the two outside burners to low, leaving the grill open while I do the next step: line a sheet pan with foil, and place a baking rack over it. I came up with this idea after grilling the ribs directly on the grill several times, and making an awful mess as the fat dripped out and coated the insides of my grill. Not only that, but the dripping fat can cause flare-ups of the flame, which isn’t good either. Place the ribs on the rack, place the pan on the grill, and fill the pan halfway with water (not so much that the rack or the ribs will touch the water). I came up with this idea after struggling to clean the sheet pan with all those scorched drippings stuck to it. 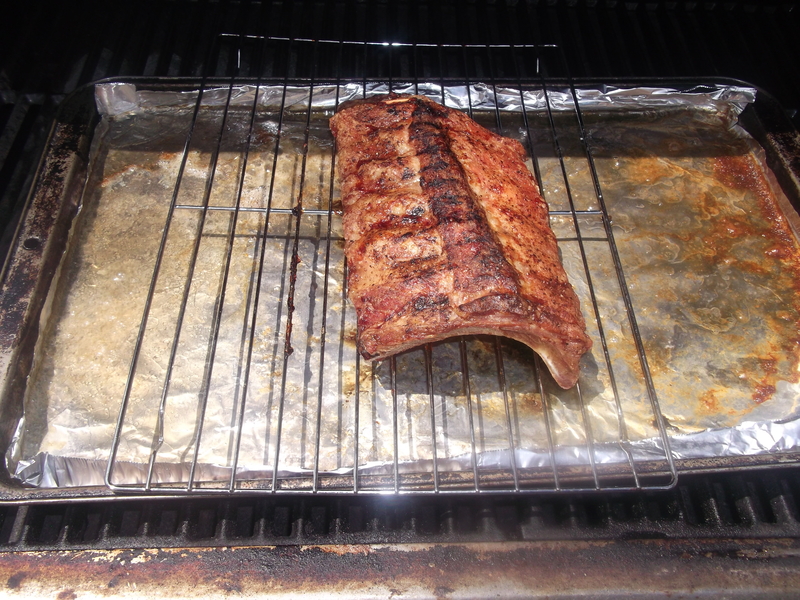 The water helps steam the ribs and keep them moist as well as prevent the drippings from burning. And the foil makes for easy cleanup. Cook the ribs (with the grill cover closed) for 4 hours at 225 to 250 degrees, turning them over every hour and topping off the water as it evaporates. 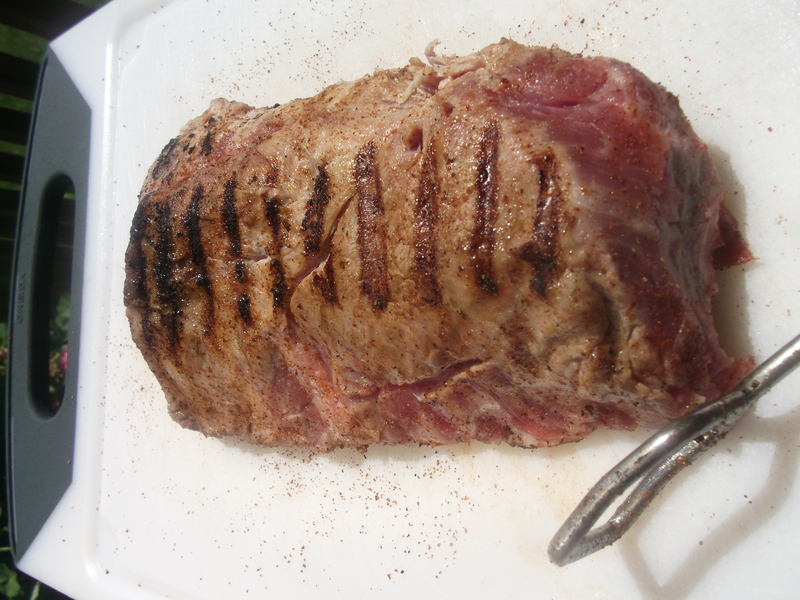 After 4 hours, remove the ribs and let sit at room temperature for about 10 minutes before serving. The ribs will pull apart easily, as they are very tender inside. Enjoy! After dinner, when the pan and foil have cooled, just pull it up carefully, trapping the drippings inside, and simply throw it away. I like ribs done all sorts of ways, but I often cook them much the same way you do. Nice recipe.